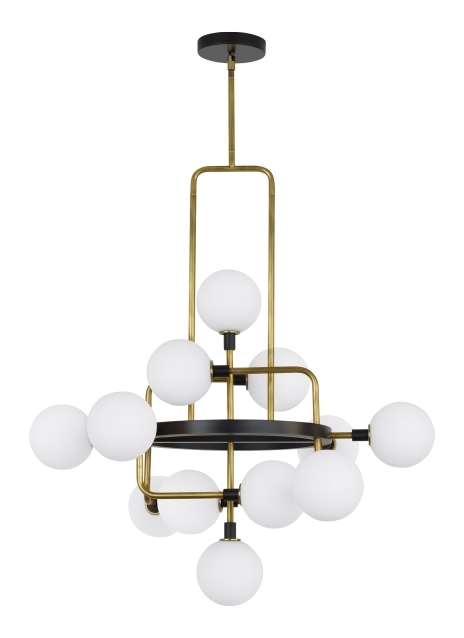 The Viaggio Chandelier by Tech Lighting features an artistic cluster of glass orbs for a sense of celestial travel within a room. A sleek black body contrast against either solid brass arms with white glass globes or polished nickel arms with mirrored smoke globes for a rich and stunning finish, either choice creates a comfortable glare-free wash of illumination onto surfaces below. This stunning fixture is also available in a Linear Suspension, wall mount and ceiling mount making the Viaggio collection highly versatile in many spaces. Available lamping options include fully-dimmable energy efficient LEDs or no-lamp, leaving you the option to light the Viaggio with your preferred lamping. No Lamp Opal glass rated for (12) 5 watt max G9 Bi-Pin lamps (Not Included). No Lamp Smoke glass rated for (12) 5 watt max candelabra base E12 lamps (Not Included). LED Opal glass includes (12) 120 volt 4.5 watt, 303 delivered lumens (3636 total delivered lumens), 3000K, LED G9 Bi-Pin lamps. Smoke glass includes (12) 120 volt 2 watt, 114 delivered lumens (1368 total delivered lumens), 2700K, candelabra base LED E12 lamps. Dimmable with most LED compatible ELV and TRIAC dimmers. Fixture provided with 60 inches of variable rigid stems (includes (2) 6" and (4) 12") in coordinating finish. Can be installed on sloped ceiling up to 45°.